Disney Dream Makers To The Rescue!!! Disney Dream Makers can help make your loved ones birthday, anniversary, wedding, honeymoon, or just a congratulations very magical. When a loved one is visiting the Disneyland® Resort, you can give something from the heart to make the celebration extra special. With their expertise in enchantment, the Dream Makers can help you create a gift experience that your loved one will remember forever. From princess tiaras and glass slippers, to pirate booty and fairy favors, the Dream Makers can create gift baskets and bouquets brimming with Disney magic that will be delivered to your loved one’s room at the Disneyland® Resort or one of our Good Neighbor Hotels. Each gift is based not just on the occasion, but also on the recipient’s interests and favorite Disney characters, and includes a card message from you. Just call the Dream Makers and they will help you choose the most magical gift for the occasion! The Dream Makers can also arrange for a celebration that takes over your loved one’s Resort room with decorations and gifts for birthdays, anniversaries, or just to say “Welcome!” Imagine your loved one’s surprise to discover an exclusive bash just waiting on the other side of the resort room door. Select from spectacular options for imaginative gift experiences. It will appear as if Mickey and the Gang have prepared the room themselves! A Disney Gift Card is a convenient way to give an experience that can be scheduled at the recipient’s leisure. Whether it’s dinner at Napa Rose or a princess makeover at the Bibbidi Bobbidi Boutique, it’s a wonderful way to give a magical moment that your loved one can arrange at any point during a Disneyland® Resort getaway. 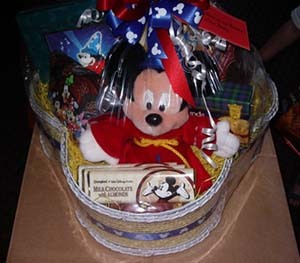 You can even tuck a gift card in one of our gift baskets to add an extra bit of magic. Call the Dream Makers to purchase a personalized gift card that will be available upon arrival. Or simply order a traditional gift card online. Both ways can create a magical memory that will last a lifetime! (781-4438). Guests under age 18 must have parent or guardian permission to call. With so many ways to celebrate, the possibilities—and dreams—are endless! Call at least 72 hours in advance of your loved one’s arrival at the Disneyland® Resort to ensure timely delivery.